Will Willimon is widely acclaimed as one of the top ten preachers in the world. For each Sunday of the Christian year, Will provides just what you need to begin the journey toward a sermon. This guide will stoke, fund, and fuel your imagination while leaving plenty of room to insert your own illustrations, make connections within your congregational context, and speak the Word in your distinctive voice. Guidance from Will Willimon is like sitting down with a trusted clergy friend and asking, "What will you preach next Sunday?" Year C Part 2 is part of a six-volume set that includes years A, B, and C (2 volumes per year) in the Revised Common Lectionary. 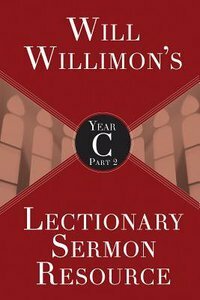 About "Will Willimon's Lectionary Sermon Resource, Year C Part 2"